Stakes are the pillars of every erect tent and are part and parcel of every adventurer. Without the fit tent stakes, your tent will never be strong and firm. It is crucial to be very careful when choosing the tent stakes that you will be using when erecting your tent as you enjoy your time in the wilderness. Carrying heavy stakes will be a significant burden for you. It will be very important for you to look for lightweight, strong and efficient stakes. Lucky for you, we have decided to prepare a comprehensive review of the stakes that will meet all these conditions. While there are many types of tent stakes, it all depends on the soil condition of the area you are planning to erect your tent. A sandy area will require simple and moderately strong stakes. A rocky area, on the other hand, will require strong and metallic stakes since you will need to hit the stakes heavily to drive them firmly into the ground. 10. 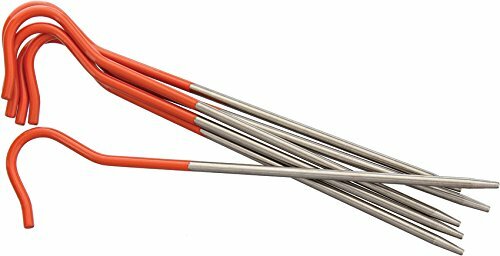 Cosmos Pack of 6 orange Aluminum Tent Stakes. What are the types of tent stakes? What is the proper way to set your tent stakes? This is our number one pick for very many reasons. The first reason is that it is ideal for camping in rugged areas. If you are planning to go camping in rocky places, this will be the best tent stake to use. It has milled points which can easily penetrate hard soils and rocks. It also has a large head, providing a surface you can hit with a mallet driver. The top part of this stake is a hard PVC material with a hook and a rope-stringing eyelet which gives a good anchoring versatility. This is another good reason to buy this product. It is corrosion resistant as it is made of galvanized steel. This stake will stand the taste of time as you explore your adventure. It comes as a heavy-duty set of 10.5’’ peg stakes. This stake is a prerequisite tool for anchoring tents, patio/garden structures, canopies, landscape trim among others. What’s more, these tent stakes have a large mallet head that will provide a large surface area to ensure that you don’t miss hitting it with your mallet. This will make sure that you increase your efficiency while hitting the tent stake into the ground. It is a heavy-duty set of 10.5’’ peg stakes. It is made with a corrosion resistant galvanized steel material which makes it be durable and long lasting. The milled points on these stakes make them sharp for penetration into the hard soil. Large mallet head also provides a large surface area for hitting it with a mallet. The PVC-top has a hook and eyelet to provide anchoring points. It has a wide application which includes being used in anchoring tents, patio/garden structures and landscape trim. The plastic tip is prone to breaking; this makes the tent stake to be very delicate. If you can’t buy the first product for some reasons, this is the alternative tent stake to use. 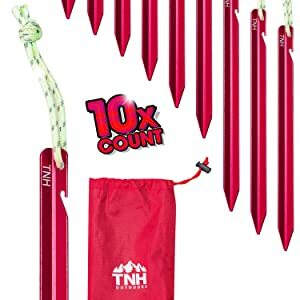 The TNH outdoors tent stakes have been made by a company run by two guys with an experience of over 20 years in the camping industry. This gives you enough reason to trust the service that this product will offer you. The company is also dedicated to sustaining the environment. 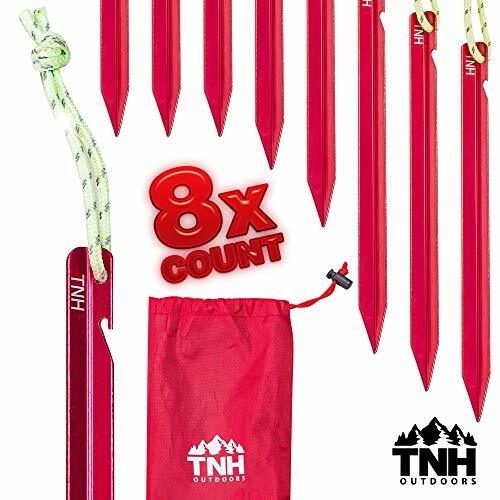 They have redesigned and engineered the TNH outdoors aluminum tent stakes to be strong and withstand the harsh realities of the wilderness. With its conspicuous color, these tent stakes are also taller to ensure that they cannot be lost in the tall grass. The conspicuous and reflective pull cord will allow you not to kick them at night. The pull cord at the same time allows easy removal in case you will need to change the site or keep trailing. It has a redesigned head that has been made to withstand the huge mallet force which makes it hard to break. 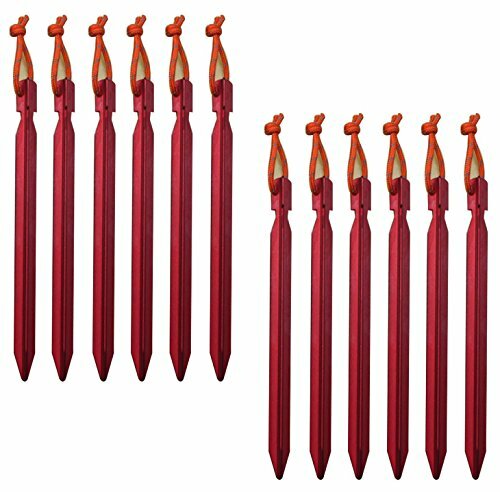 These stakes come as a kit of 10 ground stakes; this kit is portable and can easily be packed into a tent bag without a hassle. These stakes are made of high-quality materials which make them durable and long lasting. These stakes might not be suitable for areas having hard soils as they are flimsy and can easily bend when hit hard. Have a better design. The design has been redesigned for strength that will withstand any breakages. They are highly visible, cannot be lost in tall grass. The highly reflective pull cord allows easy removal and makes them conspicuous at night. Comes with a kit of 10. These are enough tent stakes to set a big tent. The stake kit can easily fit the tent bag. They are high quality with a redesigned head which makes them strong to withstand the mallet force when driving them into the soil. They are flimsy and easily bend, this will interfere with their efficiency. Are you looking for a little cheap, strong and durable stakes? If that is the case, then these aluminum tent stakes will suit you. They are strong, durable and ready to be used. The reflection rope on top of each tent stake gives an excellent visibility; this will prevent night injuries or accidents that may bring down the tents. The rope also makes them easily traceable in case they fall into the bushes. 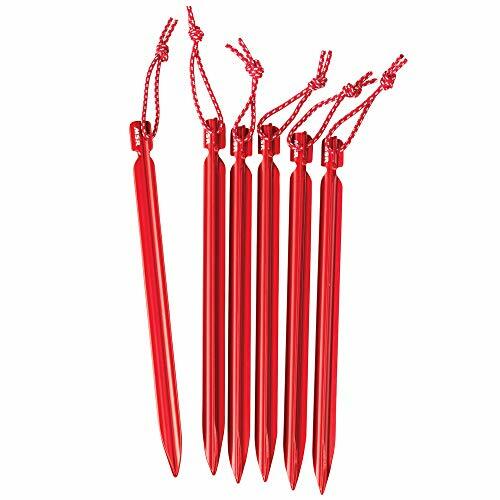 These tent stakes are made of aluminum metal and are known to be lightweight. These stakes are light, portable and come in a pouch which eases portability and storage. They are triangular in shape which allows them to have an ergonomic shape which increases stability and functionality. A pull cord is included as well to enable you to remove the stakes as fast as possible and clean them with ease. It is important to note that if you are going to use the through tarp rings, they might not fit properly. Opting for another kind of rings is therefore important. It is constructed from aluminum alloy which offers superior durability and strength. They are triangular in shape, a good ergonomic shape which increases stability and functionality. Comes with a pull cord that allows easy removal from the ground. They are light weight which makes them portable. The reflective rope on top of them makes them visible even at night. They also come in a pouch which eases portability and accessibility. They do not fit through tarp rings which makes them unreliable when using the tarp rings. These titanium constructed stakes which come in a pack of 6 are multi-purpose stakes to be used across the world of adventure. They are strong, dependable and durable. Despite being made of titanium, they are lightweight which makes them easy for backpacking. You can comfortably carry them along with you through your long travel and adventure. This innovative design has a hook shaped head for tying tent ropes on to it. The head is also painted fluorescent orange which increases visibility and reduces the chances of accidents. They are thin and sturdy which makes them easy to penetrate the hard and soft soil. They have strong shafts that will hardly bend. However, it is important to note that the orange coating is thin which makes it get worn after being used a few times. Otherwise, these stakes are great and will serve you for a long time. They are made using titanium which is a strong and lightweight metal. The hook shaped heads give good room for tying ropes. These stakes are thin and sturdy. They are also good for penetrating soft and hard grounds. The fluorescent orange coating helps you identify them during a cleanup and in case they get dropped into a bushy area. They have strong shafts that can withstand great force without bending; this helps in keepin​g the tents strong. They come in a pack of 6 which are light and can be backpacked. 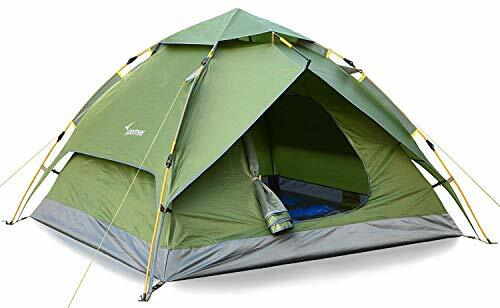 The thin fluorescent orange coat can easily be worn out and make the tent stake appear unattractive. If you are planning to make an adventurous journey that will involve setting up tents in windy, sandy or rocky areas, then you better grab yourself the SE910NRC10 tent pegs. They will glow in the dark and hold against strong winds. They have proven to be good in rocky, sandy and almost all kinds of terrains. One of the first features that attribute to these tent stakes is that they have a large stopper head and sharp pointed tips. This will allow you to easily and quickly drive them into rocky, sandy or grassy grounds. To ensure that these stakes perform their functions better are the stinging eyelets on the stopper which will provide a good position for hooks, ropes and other anchoring options. To keep you from injuries or trip-over accidents at night, these stakes glow in the dark making them completely conspicuous. They nonetheless glow brighter for a short time. What’s more, these tent stakes offer very many options for anchoring the tent. The glowing plastic parts are prone to breaking especially when using them. These pegs are good for use in camping, picnics and backyard sleepovers. They come in a pack of ten which makes them adequate for use. It has flat stopper head and pointed tip for a quick hit using a mallet into the soil. They have strong PVC stopper heads. Have large heavy-duty glow in the dark heads. It is metallic which offers strong shafts and square-cut pointed tips. It has a stinging eyelet on the stopper head which gives a good position for hooks, ropes and other anchoring options. The heads that glow in the dark are not bright enough and are prone to breaking. Are you looking for a stake to hold your tarp or tent firmly in sand or snow? These are the right pegs for you. The aluminum construction makes them lightweight and at the same time strong enough. To make sure that they offer a firm grip and hold in the flexible sand and snow profiles, they are scoped and drilled on the shafts. Snow or sand will enter these holes on the side providing grip and hence helps to anchor the tent. When done using the tent, there is a hole on the stopper where removal ropes can be inserted. They have a three-sided body structure which is great in holding them to the ground. They’re also 7 inches long hence offering enough grasp. They have an overall Y design which is good in penetrating and firmly holding in a wide variety of soil conditions. What’s more, these tent stakes are made using the 7075 aluminum which will make sure that they are light and portable enough. This makes them ideal for backpacking. As much as they are strong, they might not support a certain limit of force. So they will tend to bend, break and especially on the heads. Made of 7075 aluminum which is completely light and portable making them suitable for backpacking. They are 7 inches long which give enough length to hold the stake firmly to the ground. The Y design will allow it to penetrate and firmly hold in any soil condition. They are scooped and drilled on the sides to be suitable to be used in sandy or snowy conditions. Three sided for penetration and grasp. They bend and break on the shafts if subjected to an over limit force. Are you going to make a tent that is tri-cone in shape? These stakes will be perfect for you. These aluminum-alloy stakes are perfect for securing shelters and tents. They are portable and light in weight. These tent stakes come with a reflective cord for identification during the night, and in case they get lost. Along with them is also a handy pouch for carrying and storing them. 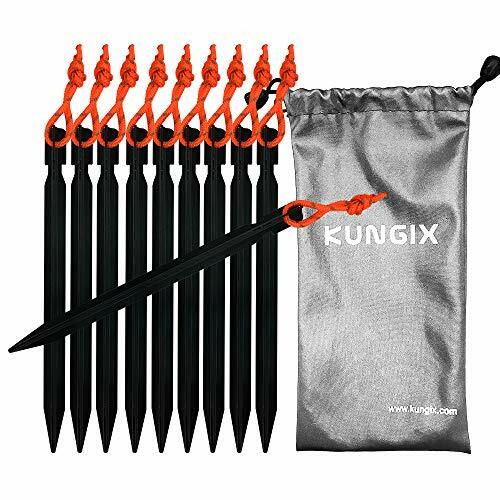 The Kungix Tent Stake Pegs come as a10 pieces kit. This makes them adequate to set a tent. They have high tensile strength than many of the 7001 aluminum stakes in the market. They also have a “Y” design which is great for penetrating different soil conditions. These stakes are very light in weight. They each weigh 0.46oz/10g meaning that they will pack right into your backpack without you feeling their weight. This is something that most outdoor adventurers are normally keen on when buying any outdoor camping gear. The 10 pieces are held in a waterproof pouch that gives ease portability. These tent stakes are good for all soil conditions, but there have been complaints about them not working well in sandy conditions. Have a good tensile strength than many 7001 aluminum alloys. Have “Y” design which is good in grasping many soil conditions. It has a reflective pull cord which makes it identifiable and conspicuous at night preventing injuries and breakages. Comes with a handy pouch for portability and storage. They are not good for sandy conditions and should therefore not be used in sandy conditions. This is another aluminum-alloy constructed stake. This stake has a tri-beam design that is light, strong and rugged. The ruggedness is specifically for holding the stake to the ground. It also has a reflective pull cord which helps in the identification, enhances visibility and also aids in its removal from the ground. It comes in a pack of 6 stakes which are each 7.5 inches and 4oz. It also has the “Y” design which offers good grip in varied soil conditions. These stakes are a perfect upgrade of the existing normal tent stakes. They will serve you well during your adventurous journey. They are amazing sturdy stakes, but they lack a good flat stopper head. That is the only issue to worry about when using these tent stakes. Light and durable, this is because of the 7075-series aluminum. They are strong and rugged to hold the ground firmly. The pull cord will aid in its removal from the soil and enhance visibility. Has a “Y” design which is good in holding in varied soil conditions. 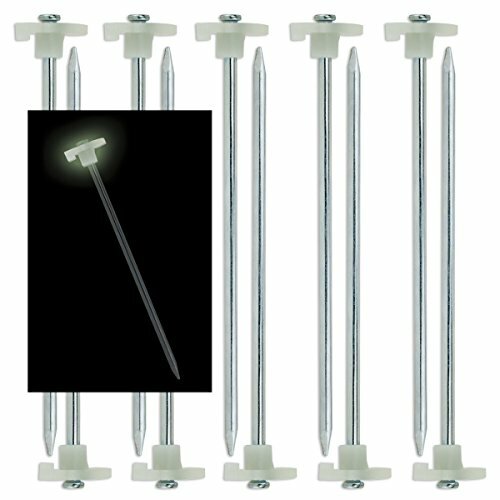 They are an upgrade of the standard tent stakes. They lack a sufficient stopper head and are therefore sometimes inefficient. 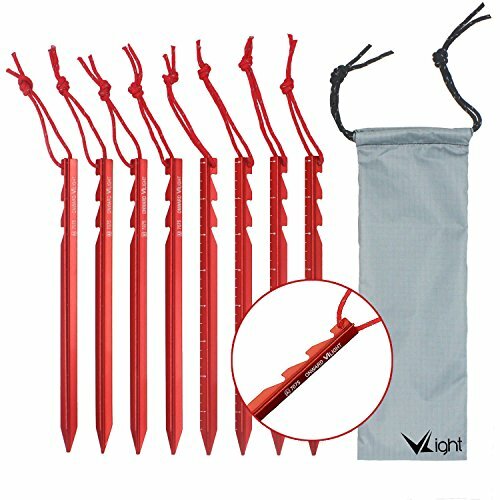 The Vilight Camping tent stakes are high quality 7075-aluminum stakes. They have been rigorously tested before being released for use. It was found that these stakes can withstand a force of 110N/mm2 and a torsional strength 1000Nm. They measure 8.3 inches long giving them a good depth to grasp the ground. They also have a Y-beam design making them good for holding grassy, sandy, soft and dry soils. They have a tall, visible design that stands over the ground making them visible and safe. To enhance their visibility because of their visible design is a visibility cord which is good for night visibility. This will make sure that people can see the tent stakes at night to avoid causing any accidents and incurring injuries. As much as they carry a “Y” design, these stakes are not perfect for desert soils. They easily bend when hammered to penetrate the desert soil. This is the only drawback to be worried about when using these specific tent stakes. Constructed using light and durable 7075-aluminum material, this enhances the durability of this best tent stake. Can withstand HB 110N/mm2 and torsional strength of 1000Nm, this makes it strong enough to serve you better. It is extra-long for maximum ground holding. It has a stronger “Y” beam construction which makes it suitable for varied soil conditions; you don’t have to worry about the type of soil you will be using it on. It is tall and visible; this means that it be easily seen from a distance. The pull cord on it will allow visibility at night; this will prevent cases of accidentally coming into contact with the stakes at night. Not suitable for desert soils, this allows them to be used in all other soil types except desert soils. These tent stakes are good to be used in sandy and snowy conditions. They have a wide and long “U” style design which makes them stronger than the normal ones. Each package comes with 6 pieces of stakes. This will make sure that you don’t run out of stakes when trying to erect a tent while camping. These tent stakes measure 12 inches long and 1.36 inches wider. They will have a good ground grip. The 6 holes on the shafts will allow a variety of rigging options. They each weigh 0.7 ounces making them light and generally portable. They have tapered tips and flat heads for a mallet drive. These Cosmos Pack tent stakes are comfortable stakes. They are also super easy to clean since they are made from aluminum. They are also safe because they have no sharp edges which might lead to accidents or injuries. You will be required however to treat them with caution. You should use a rubber mallet to drive them into the sand because they are a little flimsy. They are lightweight which makes them good for backpacking. They have 6 holes on the sides for anchoring points and to improve their grip in the sand. Safe for children, they don’t have sharp edges. Flat head and tapered rips make them easy to drive into the sand. Easy to clean since they are constructed from aluminum. They are flimsy and weak. They will require a special treat while using them. Choosing the right stake will first depend on what you are going to use it for. 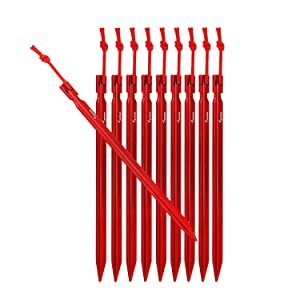 If you are going to hike, travel or camp far away from home, you should consider using those tent stakes that can be backpacked. This means that they should be lightweight and fit in the bag. If you intend to use it in your backyard for your kids’ tent, then you might want to consider those that are robust and strong. The material construction of the stake plays a fundamental role in determining the tensile strength of the stake. Titanium core is stronger than the aluminum core. A 7075 aluminum alloy will be stronger than 7071 aluminum alloy. There are those that are made with carbon fiber and are stronger and lightweight just as the aluminum and titanium ones. What will also significantly affect these stakes’ strength is the amount of metal in them. If they are thin then they will obviously bend. Those that are thick and wide will then need to be stronger to withstand a lot of force. However, your backpack will need to be a little heavier. For any stake to firmly hold the tent, it has to be firm. A firm stake will be determined by the size of the shaft that has penetrated into the ground. This will be achieved by applying some force on top of the stake, and at the same time, the stake should be tapered at the end to allow penetration. A good stake should also have a wide top to provide a sufficient area for the mallet drive. Those tent stakes to be used in the sandy or snowy conditions will require the use of plastic mallet for a drive. Visibility is very important in the campsite; you should ensure that your stakes are visible. It should, therefore, have a reflective head or a cord that will make it conspicuous when setting it into the ground. This will reduce chances of accidents as you may hit them at night. Metallic nail stakes are good for hard grounds. Titanium stakes excel when it comes to using them on the hard and rocky grounds. If well driven to the ground, they will make your tent taut and strong. With titanium, however, you will have to be a little more generous with your wallet. But they will nonetheless get the job done. They have a good strength to weight ratio. The heavier they are, the better they are. Aluminum alloy stakes, on the other hand, are light and strong. They are good for backpacking. They are cheaper than titanium stakes. 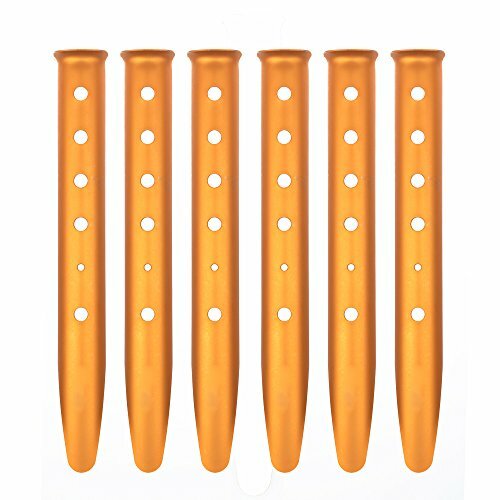 If you are going camping in areas with hard soils, windy conditions and backpacking might not be a problem; then you will need forged steel tent stakes. If you are going to set your tent in an area with soft soils, choosing stakes for soft ground will be the best choice for you. Aluminum alloy stakes are good for this case. They should be light and have graved sides to ensure that they have a maximum grip on the ground. They might also lack wide heads since they do not require any force to drive them into the ground. They are long to ensure that they have a firm enough shaft to drive into the ground for additional grip. They are stakes made for sandy, desert soil, rocky soils and more. They are normally labeled to have the “Y” design. They are light, sharp at the tips and have long shafts. They may vary in their construction structure. Some will be made of aluminum while others will be made of titanium. First place your stake in a 45o tilted position away from your tent. While still holding your stake at the same position, use a plastic mallet or the toe of your boot or shoe to hit the top of your stake gently. The stake should sink to almost three-quarter of its total height. If you realize that the stake is not sinking into the ground, try moving a little sideways or further away from the tent. You may have hit a rock or a root. When done camping, use a pull cord to remove your stakes. Avoid using logs to hit them sideways for them to loosen up. Instead, try pulling them harder. With all that said and done, we believe that you have found the best products for your next adventure. The reviewed products above are among the best on the market. They will get the job done and give you a memorable and cherished moment. We could like to recommend the SE 9NRC10 Galvanized Non-Rust Tent peg Stake with the green stopper as it is our top pick because of its amazing features. First, it is a hard ground stake; it has milled points which can easily penetrate hard soils, it also has a large head, providing a surface you can hit with a mallet driver. Its top part is made using PVC with a hook and a rope-stringing eyelet which gives a good anchoring versatility. To make it durable, it is corrosion resistant as it is made of galvanized steel. It comes as a heavy-duty set of 10.5’’ pegs. It will help you anchor tents, patio/garden structures, canopies, landscape trim among others. This is the best tent stake that you should give the priority when trying to find the perfect tent stake to buy. What do you think about our comprehensive review? Have you ever used any of the tent stakes discussed above? Which one would you like to buy for your next outdoor adventure? We would like to get your feedback. Send your comments or any other issues that you may have regarding this comprehensive review.